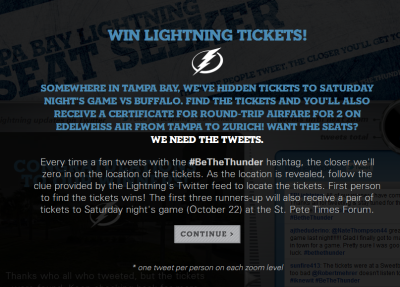 The Tampa Bay Lightning recently celebrated the start of the 2011-12 season by creating a promotional platform that rewards fans for interacting with the team on Twitter. As part of the platform, entitled the Tampa Bay Lightning Seat Seeker, fans can follow the team's official Twitter handle (@TBLightning) to receive messages when free tickets are placed at secret locations throughout the Tampa Bay area. Once the message is posted, Lightning fans are encouraged to use the hashtag #BeTheThunder to unlock clues that zero in on the location of the tickets. Once the location is revealed, the first person who finds the tickets wins them. The Lightning launched a landing page to host the Seat Seeker initiative, which features a camera that zooms in on the location of the tickets every time a designated amount of tweets occur. The site includes a countdown unit that shows how many total tweets have been posted (240+ to date) and how many are needed to activate the next zoom. The lucky Lightning fan who won tickets for the team's Opening Night game found them at a McDonald's location on West Kennedy Blvd., showcasing how teams can effectively benchmark and utilize the social media promotion to drive traffic and publicity to corporate partners' retail locations. Check it out below - a great, engaging tactic! A special thanks to Caryn Switaj of the Tampa Bay Lightning for her insights and contributions to this column! 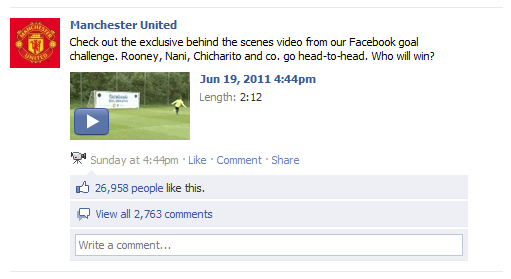 On Sunday June 19th, Manchester United posted a unique Facebook Goal Challenge video on its Official Facebook page that attracted 27K likes and 2.7K comments within a matter of just two (2) days (however, it is important to note that ManU has 16MM registered Facebook followers). The video featured a collection of the team's stars, including Wayne Rooney, Javier "Chicharito" Hernandez, Edwin van der Sar, Luis Nani, and Chris Smalling, competing head-to-head in a shooting competition. Manchester United featured a giant "Facebook Goal Challenge" banner across a regulation sized goal and tasked the players with competing in an accuracy challenge to determine an unofficial champion. There's no word on whether Facebook was actually affiliated with the promotion or if Manchester United just created the stunt while unofficially using Facebook's logo and marks. 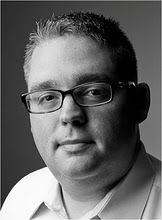 Jonathan Norman is a sports sponsorship strategist for GMR Marketing, a major U.S. sports and event marketing firm. Jonathan has been in sports marketing and media for more than 10 years, and has worked on several major corporate branding campaigns around sports. 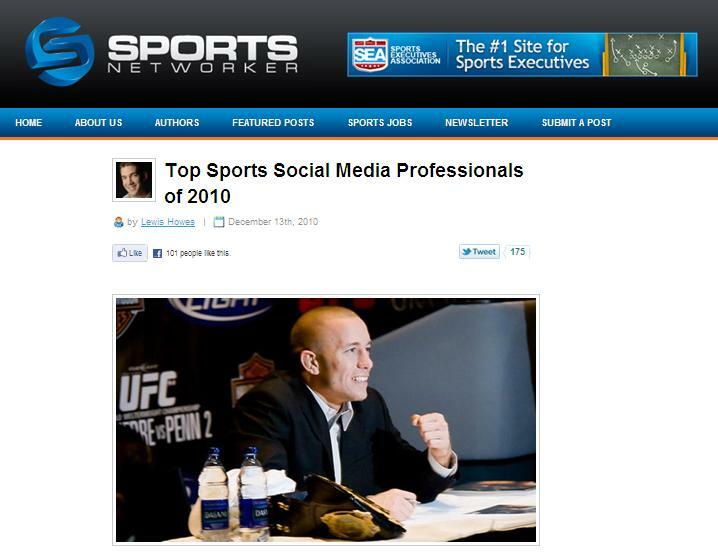 His expertise resides in how brands reach consumers through sponsorship and activation of sports properties. Follow Jonathan on Twitter at @Jonathan_Norman and his official blog here. The main ballroom at the Marriott Marquis in Times Square was filled last month with the best and the brightest from sports, as executives from the leagues, teams, networks, brands and agencies gathered for the annual Sports Business Awards. Outside the ballroom, there was a familiar scene. Colleagues and friends shared updates and insights that could lead to the next great idea in sports, and introductions were made that could lead to new partnerships that alter the sports landscape. Networking is critical for our industry, and as many of you know, it’s expanded online significantly in the last five years. Portals such as Facebook, Twitter, LinkedIn and other industry-specific social communication sites have changed the way we do business. With nearly 750 million accounts between the three major sites, the impact continues to grow. 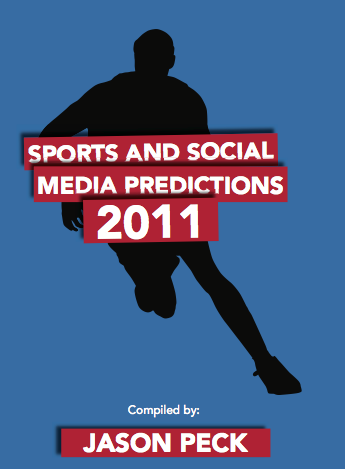 Twitter has certainly found popularity among the sports industry in particular, as 42 percent of those surveyed in the 2010 SBJ/SBD Reader Survey are using the service, up six percentage points from the previous year. Assuming that our industry has a universe of 50,000 individuals domestically and internationally (a very round estimate), that would mean that at least 21,000 of us could be connecting on an hourly, daily or weekly basis on Twitter. If we were to look at those Twitter users within the sports business community, we could likely classify them in three ways. I’ll call them “no-shows,” “lurkers” and “connectors.” No-shows are industry members who are not using Twitter. Lurkers are those who have a Twitter account, but use it only for keeping up with the news and conversation, rarely or never contributing. The connectors are those who are plugged in, both receiving and sharing information, all in a highly targeted way. Connection: Twitter provides connection points with colleagues in real time, paired with the ability to network with individuals we don’t normally come across on a daily basis. There’s real value here: Tangible business relationships are formed every day through the medium. Collaboration: Through these relationships and subsequent conversation on Twitter, we’re able to dissect important issues of the day as a group, each providing our own insights and opinions for the group to consider. While we all represent our own organizations and areas of business, we find opportunities to share valuable thoughts and ideas in an open forum. Consideration: Through connection and collaboration, we have the opportunity to consider new ways of thinking from other areas of sport. While some may criticize Twitter as a means to erupt with short-sighted musings, it is also a way to read others’ opinions as they unfold, and possibly reconsider your own positions. Current events: Twitter is increasingly becoming the go-to site for breaking news, whether it’s SportsBusiness Journal reporting a Pac-10 media deal or updates on the latest free agent signing. By simply following one of the many lists of sports business reporters, you can help eliminate the dreaded daily onslaught of Google Alerts. Over the last three years, our industry has developed a subset of executives that actively participate on Twitter, primarily through the hashtag of #sportsbiz, which is a means of identifying conversations. About 800 users consistently use this identifier to stay up to date on news, share insights, connect with fellow professionals and become more engaged in our industry. This community has become one of the critical components of the ongoing education of sports business executives across the globe. The value of this group, and others built around the sports industry, is evidenced through their rapid growths. Let it be said that the sports business forum on Twitter will never replace the value of working the ballroom and hallways at industry conferences. We need the face-to-face interactions that are the backbone of our industry. And to be fair, some of the criticisms of Twitter are rooted in the truth. While some of the early perceptions of the medium are well-founded (i.e., sharing what you had for lunch), Twitter has evolved and will continue to do so as business professionals embrace the channel. There’s little downside to joining the community. By engaging through Twitter, we all share in the ability to be more informed and in tune with the sports business industry. It allows us to serve our clients and sponsor partners better and, in the end, further develop our own ability to collaborate and connect. For smart sports professionals, I believe the choice is easy: We all have to develop an online networking game plan and execute it. Whether you’re a no-show, lurker or connector, commit to the plan and you’ll find rewarding interactions that have real business value. As geolocation based services (Foursquare, Gowalla, and Facebook Places) begin to play a larger role in the sports space, sports organizations should consider ways to instantly reward fans for their actions. Fans commonly "check-in" while attending games for a number of reasons, including interaction with other fans in attendance, sharing stadium photos, tips, and insights, and browsing various "check-in" locations throughout the stadium. But while this engagement is appealing to some, teams will likely need to begin providing fans with incentives to continue their actions, especially as geolocation based services remain in the early adoption phase. As sports organizations look to engage their corporate partners in their social media and geolocation based marketing efforts, a true opportunity exists with "instant rewards". GranataPet Snack, a German-based pet food company, recently created an interactive billboard display that rewarded all consumers who "checked-in" on Foursquare while walking their dog in front of the area. The interactive dispenser, triggered by a sensor, engaged hundreds of consumers and created an instant case study for brands and organizations looking to reward consumers in real-time for their actions on Foursquare. Teams can look to create a similar interactive display within the concourse (or adjacent to the ticket box office outside the stadium/arena during the off-season) that engages and rewards fans for their actions. Teams could provide a variety of low-budget items to consumers to create an element of surprise, including exclusive promotional giveaways, leftover premium items, autographed merchandise, t-shirts, mascot rewards, and products/services provided by corporate partners. GrenataPet Snack reportedly worked with a German-based agency called Agenta to execute the campaign. We'll be on the lookout for vendors that can build and execute an interactive Foursquare-based prizing system! 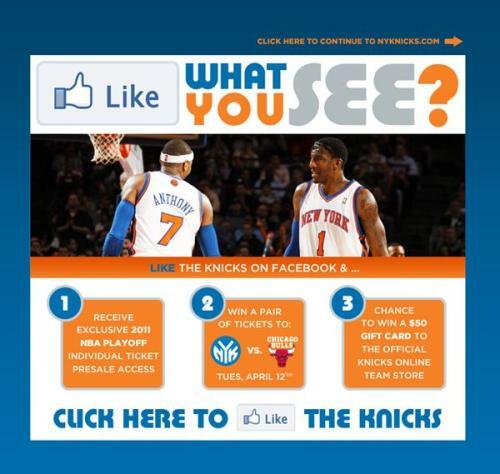 As the New York Knicks head into the 2011 NBA Playoffs, the team is featuring a terrific splash page on its official website, http://www.nba.com/knicks (ala Knicks.com), that encourages fans to "like" their official Facebook page. The creative digital marketing tactic serves as an effective way to drive interest and awareness for the team's social media initatives amongst 200,000 unique site visitors per day (per Compete.com, the Knicks' website attracted 6.2MM unique visitors in February 2011). To drive fan participation in their social media efforts, the Knicks are offering a variety of incentives, including access to an exclusive pre-sale for all playoff tickets, a chance to win a pair of free tickets to see the Knicks take on the Chicago Bulls on April 12th, and a chance to win a $50 gift card that is redeemable via the Knicks' official online team store. Once fans click through the splash page, the Knicks are providing a call-to-action via interactive digital inventory on the team's official website. Since the Splash page was posted on March 12, "likes on the New York Knicks' Facebook page were up 27% (130K total) and their Monthly Active Users spiked 18%... pretty remarkable success. Check out some visualizations of the campaign below. Hats off to the Knicks on executing such a terrific campaign! A special thanks to Lowell Berg of Ohio University for his insights and contributions to this column!